When people look at The University of Iowa logos, they do not just see the logo. They see degrees and instructors, Herky the Hawk and legendary coaches, athletic events and the Old Capital. To them, The University of Iowa logos represent the sums of many cherished memories, events, experiences, and relationships associated with their beloved Iowa Hawkeyes and The University of Iowa. How people – alumni, students, future students, potential donors, fans, and the public at large – feel about The University of Iowa directly relates to the University’s success. In a sense, the logo speaks on the University’s behalf without saying a word. It represents who we are and what we stand for. It is the visual representation of our reputation. Therefore, it is vital to build and maintain a strong logo, a strong visual identity. To accomplish this, the logos must be used in a consistent way. They must appear the same in every instance. They must have the proper shades of Hawkeye Gold, be properly aligned, and be in the proper proportions. They must be used in appropriate contexts. 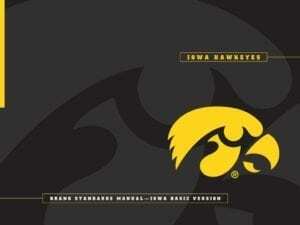 This style guide establishes the rules for the University’s logos and additional identity marks, such as emblems, word marks and Herky the Hawk. Inside, you will find what you need to know about using The University of Iowa word marks, trademarks, and logos. Proper and legal use of the logos protects the University’s image and distinguishes us from other institutions.